Every year since my son’s untimely passing we have held some sort of fundraiser in his memory. Brian had such a passion for helping needy and abused people and pets—a kid after my own heart. It was our third year and I’d actually become weary and wanted to give up. We had some support, but it seemed like we didn’t get the funding other larger groups had, which left me and my family to bear much of the work and finances on our shoulders. “Maybe,” I replied, wanting to forget everything I knew about cancer, since it had taken my sister’s life just six months earlier. Besides, I didn’t know if I could take on another fundraiser. Strange, though, this idea kept bouncing around in my head. I even got excited thinking about it. It kept me awake at night. I had to often jump up and write something down, afraid I might forget. “Sounds like a great idea,” he said. 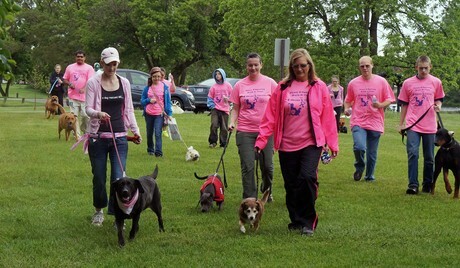 So began our Paws for Healing Walk-a-thon for Abuse and Cancer of People and Pets. The event started pretty much like I had thought, all on my shoulders. But I did have one amazing volunteer. After discussing the walk with her and making up flyers, she decided to go door to door at local businesses asking about sponsorship. Miraculously, we had enough sponsorship in just one week to purchase our event t-shirts and promotional materials! I quickly sent out our first press release to local media about our Paws for Healing Kick-Off for June 1, 2013. We got a few calls, some people were interested, others were asking for more information. But then I got an email from Melissa Wheeler. 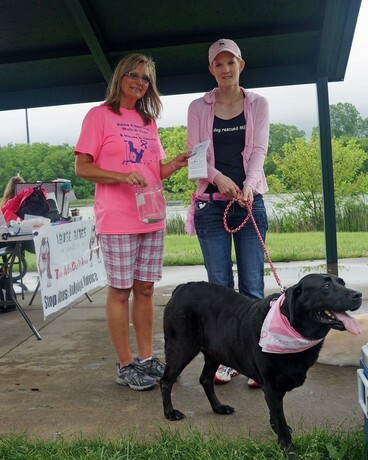 She not only wanted to sign up for the walk, she wanted to be a two paw sponsor (one paw for each of her dogs), and she pledged to raise at least $500. I was so pumped and excited as I read the email. Then came her bittersweet story. 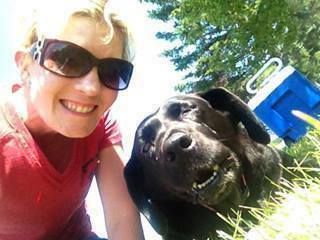 Melissa’s Black Lab, Ruby, was battling cancer. Melissa’s husband, Harvey had found the tumor right after Christmas. In the past few months, Ruby had two surgeries to remove two tumors and went through five chemo therapy treatments. The prognosis wasn’t good, but Melissa and Harvey remained hopeful, determined and insistent on participating in this event for “Team Ruby”. They wanted to raise $500 because that’s what it costs for one chemo treatment for Ruby. Wow! Their story blew me away! That’s when I knew Ruby should be the Paws for Healing Walk-a-thon mascot. I met Ruby for the first time on June 1st at our kick-off event. I was expecting her to be weak, limping, or just laying around, since she’d just had her sixth chemo treatment the week before. But, not Ruby. She tromped into that event, head held high, big smile, tail wagging, and just raring to go. After a moment of silence for victims and survivors and a short prayer, Ruby led the way, ahead of all the other dogs and owners, to the trail through the woods. There was nothing holding that dog back. Melissa could barely keep up as Ruby pressed on ahead. I had to slow them down later so I could get a group photo. Although we didn’t have a large turn out, like I had hoped for the event, Team Ruby’s supporters were there cheering her on. What a sight to see! Over the course of the summer, during the walk-a-thon, I kept in touch with Melissa on Ruby’s health. She has endured a few other speed bumps. Chemotherapy began making her sick, so the Wheeler family had to make the decision to stop all treatments. The chemo also caused Ruby to lose her sight and she started bumping into things. 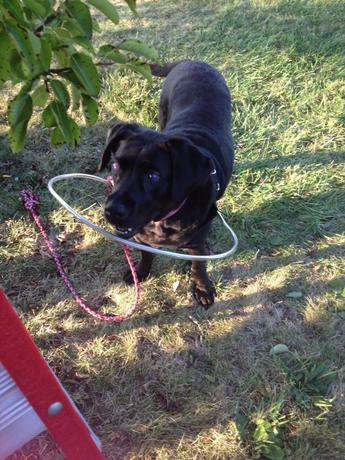 Thankfully, her parents found this really cool halo she now wears to protect her and keep her safe while she lives out her life. Ruby, her mommy, and daddy have all remained strong, carried the torch, and even surpassed their goal of raising $500. 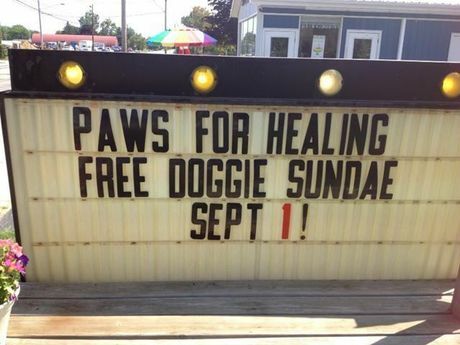 I’m not sure just how much money they have raised since they are doing one final fundraiser on September 1st at the SuperCone where they will be dishing out “Free Doggie Sundaes” for donations, but I can assure you, that they have given their all to pave the way for others healing. So even though this event seemed small in the beginning, big things are happening for people and pets thanks to “Team Ruby” and her paws for healing.